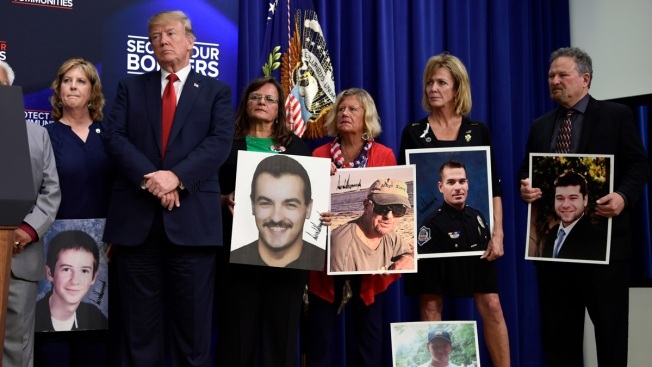 The central piece of Trump's attempts to counter-program against the despairing images at the border was to stand with the "angel families"
In this June 22, 2018, photo, President Donald Trump, second from left, listens as he stands with people during an event on the White House complex, who have lost family members from crime committed by undocumented immigrants. President Donald Trump cast doubt Friday on wrenching tales of migrant children separated from their families at the border, dismissing "phony stories of sadness and grief" while asserting the real victims of the nation's immigration crisis are Americans killed by those who cross the border unlawfully. "You hear the other side, you never hear this side," said Trump, standing with a dozen of what he calls the "angel families" who lost loved ones at the hands of people in the country illegally. He focused on the fact that young migrants separated from parents are likely to be reunited, unlike the victims of murders. "These are the American citizens permanently separated from their loved ones. The word 'permanently' being the word that you have to think about. Permanently — they're not separated for a day or two days, these are permanently separated because they were killed by criminal illegal aliens." Amid mushrooming bipartisan concern over depictions of terrified migrant children separated from their parents, Trump on Wednesday had abruptly reversed course and signed an executive order to overturn the policy, although up to 2,000 children are still believed to be separated from their parents. But that rare moment of public capitulation was brief from the president, who laced his remarks at a rally in Minnesota that night with hardline immigration rhetoric that continued Friday. In a tweet, the president raised questions about whether the migrants' hardships really existed. "We must maintain a Strong Southern Border," the president tweeted. "We cannot allow our Country to be overrun by illegal immigrants as the Democrats tell their phony stories of sadness and grief, hoping it will help them in the elections. Obama and others had the same pictures, and did nothing about it!" Trump's suggestion that the stories were erroneous was likely fueled by revelations Friday about one of the defining images to this point in the crisis, a 2-year-old Honduran girl crying as her mother was stopped by a Border Patrol agent. But the girl in the photograph, who ended up on the cover of Time Magazine this week, was not separated from her mother but detained with her, the child's father told the Daily Mail. Time Magazine said it stood by the image because it captures "the stakes of this moment." Trump has long chafed at the media's treatment, his fury only growing in the past week when he felt that he did not receive proper credit for his summit in Singapore with North Korean leader Kim Jong Un. Some conservatives seized hold of the photo faux pas to attack the media, and White House press secretary Sarah Huckabee Sanders tweeted, "It's shameful that dems and the media exploited this photo of a little girl to push their agenda." Other Trump allies have gone even further. Ann Coulter, a conservative pundit, said Sunday in an interview on Fox News that kids at the border were "actor children" who were "given scripts to read by liberals." Coulter then turned to the camera and said to Trump, "Don't fall for it." The director of a Westchester facility housing some migrant children separated from their families at the border speaks exclusively to Melissa Russo. A number of Democrats aggressively pushed back against Trump's claims. 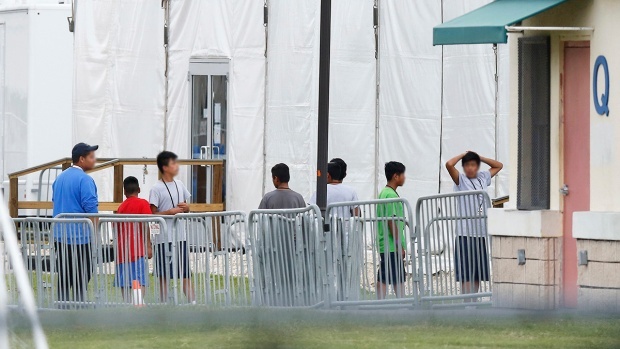 Rep. Peter Welch of Vermont said Friday that Trump's assertion was "bizarre" and that the border patrol processing center he visited in Texas in recent days was "nothing short of a prison." But the central piece of Trump's attempts to counter-program against the despairing images at the border was to stand with the "angel families," as he did repeatedly during his presidential campaign, including at the 2016 Republican National Convention. At the somber event at the White House complex on Friday, Trump introduced the families, who delivered heartbreaking tales of their loved ones' lives and, at times, gruesome descriptions of their deaths. "Your loss will not have been in vain," Trump said. "We will secure our borders, and we will make sure that they're properly taken care of." The president also rattled off a litany of statistics that indicated that illegal immigrants commit violent crimes at a far higher rate than U.S. citizens, saying "you hear it's like they're better people than what we have, than our citizens. It's not true." At the event, Trump also bashed "the mayor of San Diego" for warning citizens about immigration agent raids. But the mayor of San Diego, Kevin Faulconer, is a Republican who did not provide a tip; a mayor who did was Libby Schaaf, a Democrat from Oakland. Associated Press writer Colleen Long contributed.